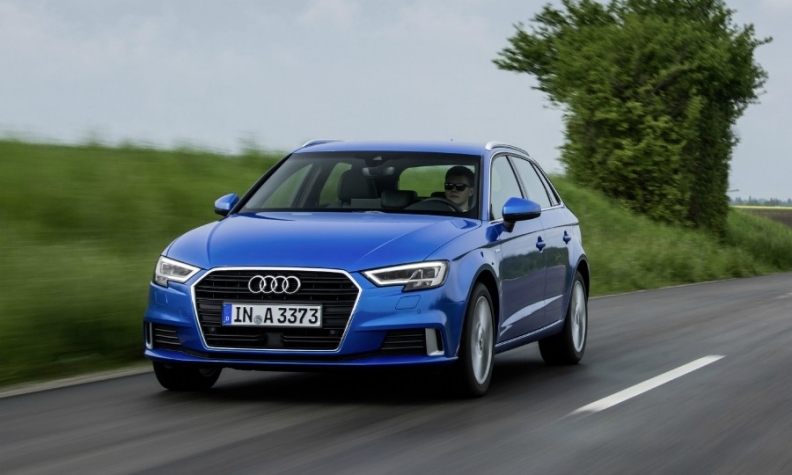 The Audi A3 was Europe's most popular compact premium model despite a double-digit sales decline. 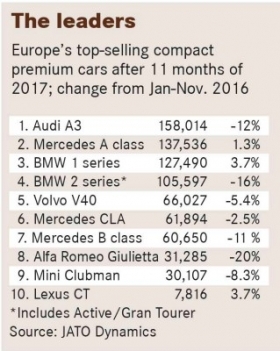 Aging models such as the BMW 1 series and Audi A3 as well as the continued rise of SUV alternatives will cause sales in Europe’s compact premium segment to fall for a second consecutive year, according to predictions. The sector had been one of Europe's most dynamic in the last decade as BMW, Audi and Mercedes-Benz added more variants to their compact lineups. However, after exceeding 1 million sales in 2016, the sector dropped below that number last year and will struggle to top 900,000 in 2018, LMC Automotive forecasts. The biggest pressure on the segment will come from the arrival of new premium compact SUVs such as the BMW X2, Jaguar E-Pace and Volvo XC40, said David Oakley, LMC’s analyst for Europe, the Middle East and Africa. The segment-leading A3 and the third-ranked 1 series aren't due to be replaced until 2019, dissuading customers from choosing cars that will be 7 years and 8 years old, respectively, when they are updated, JATO Dynamics global analyst Felipe Munoz argued. "Their current models are too old and not attractive enough" to lure buyers away from newer compact SUVs from both premium and volume automakers, he said. Mercedes has the chance to pull ahead of its two biggest rivals by launching the new A class this summer. 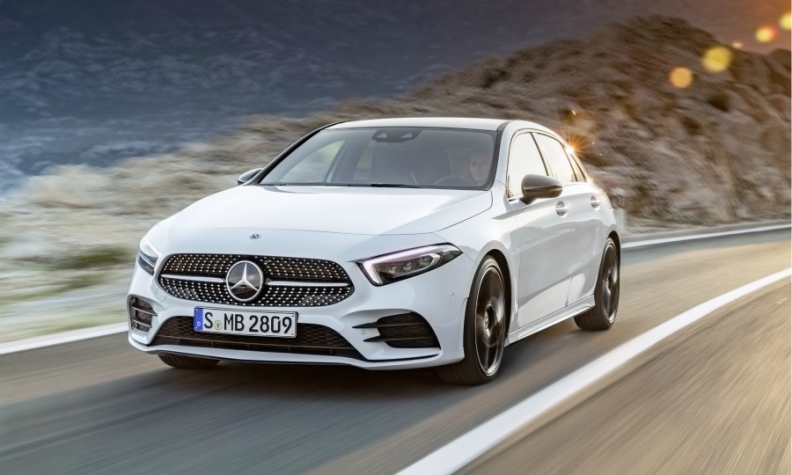 The German automaker recently released details of the fourth-generation A class ahead of its debut at the Geneva auto show next month. Mercedes promises the new car will be a larger and more luxurious model than the current car. The A class, combined with the arrivals of the A3 and 1 series next year, will help the segment rebound in 2019 and push sales past 1 million units again in 2020 before leveling out, according to LMC. However, LMC believes that premium compact SUVs, which Automotive News Europe counts in a separate segment, will continue to put pressure on hatchback equivalents. The compact premium market tracked by ANE includes hatchbacks (the core model) as well as sedans, minivans, coupes and cabriolets. If you take away the non-core models, sales of compact premium hatchbacks will be overtaken this year by premium compact SUVs for the first time, 518,480 to 459,110, LMC predicts. By 2022, SUVs will outsell hatchbacks 735,268 to 571,034, LMC forecasts. Germany's top-selling premium automakers are the dominant players in the segment, with only Volvo making any kind of threat with its V40 model, which ranked No. 4 through November of last year. Even the niche Mercedes CLA four-door coupe beat rivals such as the Alfa Romeo Giulietta and Mini's disappointing Clubman. "The client base for compacts is very conservative, barely changing model and brand," JATO's Munoz said. Mercedes has said it will increase the number of variants offered in its A-class and B-class range to nine, up from six now. Future variants will include an SUV for the B-class, a seven-seater B-class and sportier A-class variants, possibly a coupe and a convertible. An electric compact model, previewed by the EQA shown at last year's Frankfurt auto show, won’t be part of the traditional Mercedes-Benz range. As other EV models, the EQA will be part of the EQ subbrand, that will become, such as sporty AMGs and luxury Maybachs, an added badge to the Mercedes name. Mercedes has unveiled the new generation of its smallest model, the A class. BMW has already launched a sedan version of its next 1 series in China, making it the first 1 series to use the automaker's UKL front-wheel-drive platform. All future 1-series variants will use the platform as BMW switches from the rear-wheel-drive setup used by the first two generations of the car. The next 1 series will reportedly drop its three-door version in response to plummeting sales of that body style in the sector. Audi and Mercedes have already made similar moves. Three-door versions accounted for just 4 percent of the market across Europe in 2017, according to JATO data. Audi stopped building the three-door A3 last year and has said it won't offer a three-door variant with the new model. 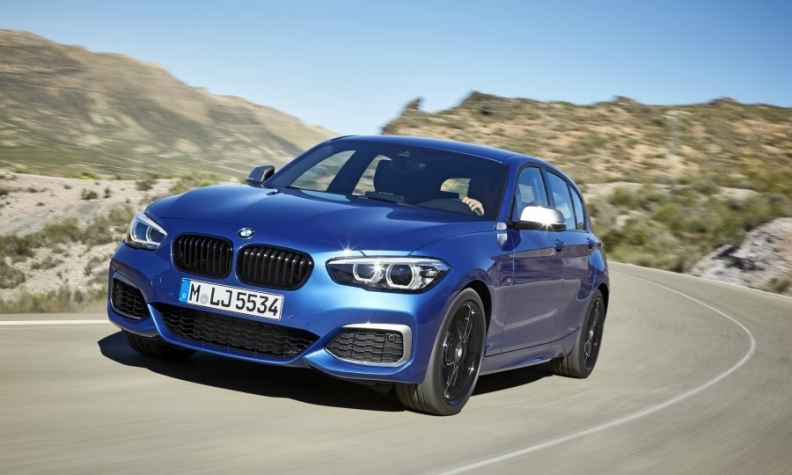 When BMW replaces its current 1 series (shown) in 2019 it will switch to front-wheel drive. Following a trend in Europe and especially in Germany, buyers moved away from diesel-powered cars in the sector resulting in a 15 percent decline in the first 11 months of 2017. Despite the decrease, diesel remained the fuel of choice in the segment with a 54 percent share, according to JATO figures. Plug-in hybrid or hybrid versions accounted for 2 percent of sales in the sector. Audi broadened its gasoline range in 2016 to include a 1.0-liter three-cylinder turbo unit, but the sector's customers haven't shown much interest in smaller engines. Sales last year of cars with 1.0- to 1.2-liter engines (limited to the Audi A3) dropped 72 percent to account for less than 1 percent of the market. The segment’s buyers prefer 1.4- to 1.6-liter engines, which accounted for almost half of all sales last year. However, the big growth in the sector has been in performance versions, for example the Mercedes A45 AMG, Audi S3 and RS3, and BMW M140i. Sales of cars that offer more than 200 hp rose 14 percent last year to take a 9 percent share of the segment, JATO data shows. 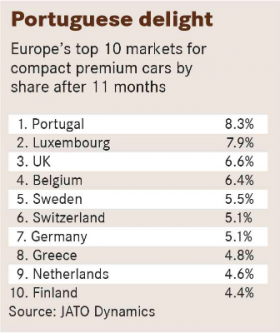 Geographically, the biggest market for compact premium cars is the country you would expect: Germany, with sales of 161,272 last year. The UK, however, was a close second with sales of 157,183, double that of the No. 3 market, Italy. Across Europe, the segment accounted for 4.5 percent of overall European sales. Portugal achieved almost double that at 8.3 percent, making it the biggest market by share. Luxembourg was second at 7.9 percent while the UK rounded out the top three at 6.6 percent.